NOTE TO READERS: For the remainder of this week, text and responses to Comment requests will be delayed until the night after charts have been posted. NETWORK FINALS: Since there was no text for the morning prelims, a bit more detail on the final numbers. ABC: ONCE UPON A TIME and the rerun of AMERICA’S FUNNIEST HOME VIDEOS came up 0.1 in final numbers, which left QUANTICO down 0.1 from last week’s final, while ONCE and THE FAMILY were steady. CBS: THE GOOD WIFE adjusted up 0.1, which left 60 MINUTES down 0.6 from last week, and MADAM SECRETARY and ELEMENTARY each down 0.2. NBC: LITTLE BIG SHOTS and both episodes of CROWDED came down 0.1 in finals, putting LITTLE BIG SHOTS down 0.3 from last week, while DATELINE was up 0.1. FOX: BORDERTOWN adjusted up 0.1, meaning that COOPER BARRETT’S GUIDE TO LIFE and BOB’S BURGERS (which followed a SIMPSONS rerun this week) were down 0.1 from last week. CABLE HIGHLIGHTS: HBO is counting the minutes until next Sunday’s return of GAME OF THRONES after its early spring line-up fizzled: the season finale of VINYL dropped 0.04 to 0.20, and the two-episode GIRLS finale was at 0.24/0.21, compared to last week’s 0.27, while LAST WEEK TONIGHT was down 0.07 to 0.29. Things were no more cheerful at the other pay networks. 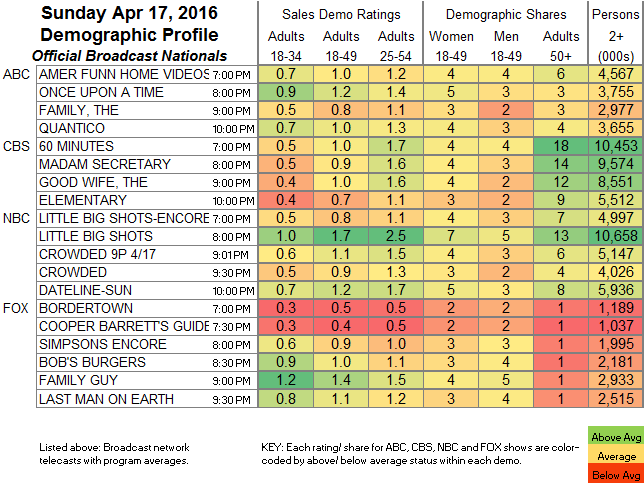 On Showtime, HOUSE OF LIES added a hundredth to 0.18, and DICE dropped 0.04 to 0.07. Starz’s THE GIRLFRIEND EXPERIENCE was down 0.03 to 0.08. AMC’s FEAR THE WALKING DEAD dominated the night once again, but it fell another 0.55 from last week’s season premiere to 2.53 (last season’s 2d episode was at 4.1). That pushed TALKING DEAD down 0.21 to 0.84. TNT had the night’s NBA PLAYOFFS, with games at 1.68/1.38/1.29. Discovery’s NAKED & AFRAID was steady at 0.83. On Bravo, SHAHS OF SUNSET gained 0.04 to 0.70, REAL HOUSEWIVES OF THE POTOMOC ticked down to 0.63, and THICKER THAN WATER returned at 0.36. Adult Swim’s ROBOT CHICKEN fell two-tenths to 0.64, and MIKE TYSON MYSTERIES was at 0.55, with MR PICKLES at 0.41. Food Network’s SPRING BAKING CHAMPIONSHIP gained 0.09 to 0.48, and CUTTHROAT KITCHEN was also up 0.09 to 0.43, with GUY’S GROCERY GAMES up 0.03 to 0.40. A Daniel Tosh STAND-UP SPECIAL on Comedy Central was at 0.46. Nat Geo’s STORY OF GOD rose 0.08 to 0.43. A&E’s INTERVENTION ticked up to 0.42. Spike’s BAR RESCUE fell a heavy 0.17 to 0.38, and LIFE OR DEBT lost 0.04 to 0.19. 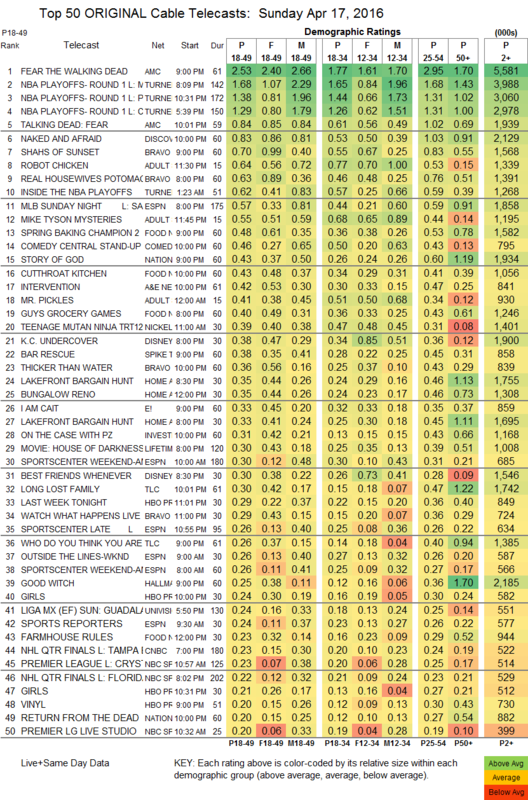 E!’s I AM CAIT gained 0.02 to 0.33. On TLC, LONG LOST FAMILY was up 0.04 to 0.30, and WHO DO YOU THINK YOU ARE rose 0.05 to 0.26. Hallmark’s GOOD WITCH returned at 0.25. The TV LAND ICON AWARDS scored 0.13 on Nick At Nite and 0.07 on TV Land itself.